The cold war is over, and Keith Landry, one of the nation’s top intelligence officers, is forced into early and unwanted retirement. Restless, Landry returns to Spencerville, the small Midwestern town where he grew up. The place has changed in the quarter century since Landry stepped off his front porch into the world, but two important people from his past are still there: Annie Prentis, his first love, and Cliff Baxter, the high school bully who became the police chief of Spencerville and Annie’s possessive husband. They’re all about to come together again-and rip Spencerville apart with violence, vengeance, and renewed passion. 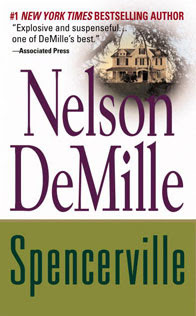 I’ve often heard rave reviews and praises about Nelson DeMille’s books so, when I found a copy of Spencerville in my mother’s library, I decided to read it and see what the hype was all about.Unfortunately, it was only after I’ve finished it that I realized that even DeMille fans think this is the worst book the author has ever published. Had I known that before, I probably would have read some other work of his because Spencerville doesn’t do this author any favours. And it left me hesitant to read anything else from him.. Yes, I disliked it that much. Spencerville is both a romance and a thriller but somehow manages to be really bad at both genres. Keith Landry, an ex CIA agent forced into early retirement, returns to his native town, Spencerville. His ex-girlfriend, Annie Prentis, still lives there too and he hopes to rekindle his romance with her. But Annie is (unhappily) married to Cliff Baxter, the police chief of the town, who is a bully with a sadistic streak and no redeeming quality. From the moment Cliff learns that Keith is back in town, he decides that Spencerville isn’t being enough for both of them and decides, with the help of the corrupt officers, to make his life hell, hoping this way to force him away of the town again. Can you see where this is heading? Keith and Annie eventually get back together and decide to flee Spencerville. But their departure is delayed to the very last minute and Cliff is soon on their tracks. Being an ex CIA agent, you’d think that it’d be easy for Cliff to escape (after all DeMille keeps telling us how intelligent and good at his job he is and that he’s been in worse situations in more dangerous parts of the world), but he just keeps making one mistake after the other. The character of Cliff isn’t well-developed either. Actually it’s not developed at all. He’s just a charicture of evil. And what about the last person in the triangle? Annie is portrayed as a goodie-two-shoes and very religious, yet she doesn’t hesitate to sleep with Keith. I understand she comes from an abusive marriage but that just seems out of character to me. It seems to me that DeMille wants us to believe his characters are a certain way, and then makes them act the opposite! The story itself is not that compelling either. There are a couple of suspensful moments, but most of it is quite predictable. The book is also too long and that’s because the characters often reminisce about the past, especially their years at collage, and reflect on how senseless the Vietnam war was. I would have loved it if there had been some flashback of the characters actively taking part in the war and relate its horrors, instead DeMille simply keeps repeating his opinion of the war throughout the book. I may agree with him, but after a while it starts sounding like a broken record and becomes boring. There are also a lot of swear words and vulgar language in the book, which annoyed me a little. I know that some people talk like that and if it suits the character, I don’t mind. But every character in the book seems to talk like that! It may not be anything major but I just thought I’d point it out for people who, like me, hate that kind of language, especially when used just for the sake of it. Spencerville by Nelson DeMille is both a romance and a thriller but fails miserably at both. The main characters aren’t well-built and often act out of character. In addition, the story is predictable and flows very slowly and the reflections about the past and about how senseless the Vietnam war was makes it a lot longer than it should have been. The language is crude and vulgar too.